And the defensive numbers don't get much better the more you look. Though the final defensive numbers from 2017 are unable to be sugar-coated, nobody involved with Lehigh's defense is running away from the facts this spring. In fact, they feel they are better than this. "When you hear so much about your defense not being good," defensive coordinator Craig Sutyak said this week, "you start to believe it, and I think our kids started to believe it too the last couple of years. But we're not going to beat ourselves. We're going to have faith in ourselves, faith in the guys next to us, and we're going to continue to grow as a unit." Nobody involved in the Lehigh football program are making excuses for last year, but looking at the unit objectively, there were a staggering number of injuries on the defensive side of the ball. By the final game of the season vs. Stony Brook, NG Jim Mitchell, ROV Nick Thevaganayam, SS Sam McCloskey, and CB Donovan Harris were all lost due to season-ending injuries, and DE Harrison Kauffman, DB Quentin Jones and DB Kareem Montgomery were starting in positions different than the ones they played in the season opener vs. Villanova. During that Stony Brook game, 12 of the 22 names on the defensive two-deep were either freshmen or sophomores, but the silver lining is the experience that gave a bunch of the members of the defense. As a result, the Mountain Hawks enter the spring with a team that has a significant amount of experience against top-notch FCS competition. On the defensive front, Lehigh waves goodbye to DE Tyler Cavenas and DE Harrison Johnson, as well as NG Jim Mitchell. But rising senior DL Harrison Kauffman, senior DL Julian Lynn and senior DL Juwan Morrow got lots of game experience and are ready to step into bigger roles on the defensive front. "We want to improve and become more consistent," linebacker coach Mike Kashurba said. "There's a lot to the reads and reactions." It will be interesting to see where Kauffman, Morrow and Lynn line up this weekend in the Spring game, as all of them have the ability to either line up inside as defensive tackles (or even nose guards) or outside as defensive ends. In fact, it's easy to see a goal line setup with Kauffman and Lynn at end, Morrow at tackle, and junior NG Colin Nace clogging the middle. Stopping the run and big plays in the run game certainly will need to be a point of emphasis this spring. And there's certainly room to have one or more of these defensive linemen rise to the top of the board with a great spring and a great preseason. Sophomore DL Jack Kircher is one guy I'm wondering might end up on the depth chart in September. If you watch Lehigh Sports' preview about the linebackers this spring, you get a lot of face time with a lot of linebackers. Senior LB Mark Walker, senior LB Matt Butler, junior LB Keith Woetzel, sophomore LB Pete Haffner and sophomore LB Nate Norris all take turns making appearances. It stands to reason that they will all be on the depth chart somewhere - but where? 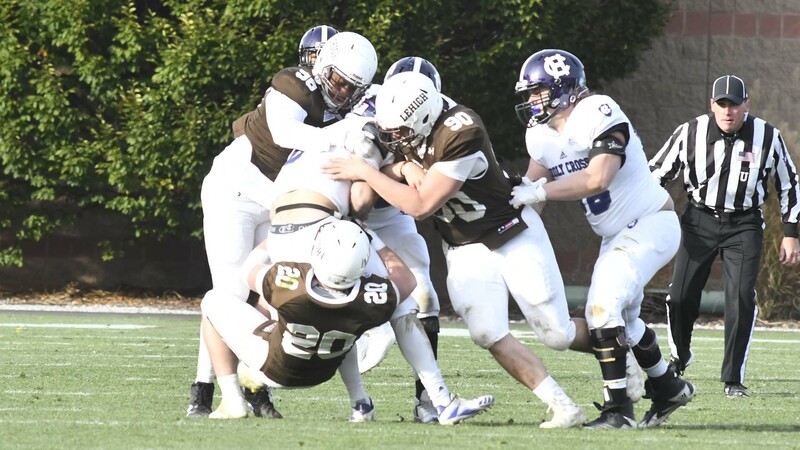 Woetzel, who led the Mountain Hawks with 89 tackles last year, and Walker, who came on late in the season and recovered what might have been the most significant turnover of the season at Colgate, seem poised to be the bread and butter linebackers this spring. "I like what we've been doing this spring," Walker said. "We're going to be more downhill, more aggressive. More turnovers, tackles for loss ought to come." It's clear, though, that this spring season will be the showcase for Butler, Haffner, Norris and perhaps junior LB Jon Seighman and senior LB Brian Olshanski to show what they can do. From LehighSports.com's video, improving tackling overall seemed to be a huge priority. That makes sense, as missed tackles on some big plays last year led to some big scores. Head coach Andy Coen is also excited about the energy linebacker coach Mike Kashurba will be bringing to the Mountain Hawk defense as well. It will be interesting to see how that energy translates to the field this Saturday. "The first thing is tackling better," Sutyak said. "Really focusing on the approach of the tackle, executing the tackle, drilling it every single day." As a Lehigh fan, I see the flexibility for this defense to line up in a Villanova-style 3-3-5, a Stony Brook-style 4-2-5, or any combination in between that and a basic 4-3. Will the emergence of, say, a Nate Norris force the issue? Different combinations of the linebackers is what I'll be looking at this spring, seeing who's on the field, when. While the secondary waves goodbye to DB Quentin Jones, who made a remarkable recovery from injury at Yale in 2016 to start all season in the secondary last year, the 2018 Lehigh Mountain Hawks will welcome back a boatload of players who have had success in the secondary in Lehigh's five defensive back system. Part of the reason why Lehigh won their second consecutive Patriot League championship was that rising sophomore ROV Divine Buckrham was able to take over at that position by the end of the season, finally solidifying that spot enough to help Lehigh win their last three games to clinch the title. His seven tackles vs. Bucknell was his season high, and it's exciting to see what strides he's made this offseason. "Game reps are huge, that's the biggest thing," senior SS Sam McCloskey said of Buckrham and the rest of the young secondary. "You play well in practice, but it's a different thing going out there on Saturdays." Buckrham joins junior FS Riley O'Neil, who will be entering his third straight season starting in the secondary, and senior DB Kareem Montgomery this week in the spring game. McCloskey, who will not be participating in the scrimmage portion, and senior CB Donavon Harris, who is 50/50 for playing in the scrimmage this weekend, are expected to be vying for the top spots this August. "We have the opportunity to be the best secondary in the Patriot League," McCloskey said. "We just have to pull it all together." One of the important reveals in the video is that McCloskey and Harris, based on their injuries last season, will have the opportunity to apply for a fifth year if they choose, meaning they may have two years of eligibility remaining, not just one. "We bring that leadership, and that experience," Harris said of himself and McCloskey. "We're excited to get back at it and fly around with those young guys." Without McCloskey and perhaps without Harris this Saturday, junior CB Marquis Wilson, sophomore CB Jaylen Floyd, and sophomore DB Tre Neal should be front and center this Saturday vying for spots. 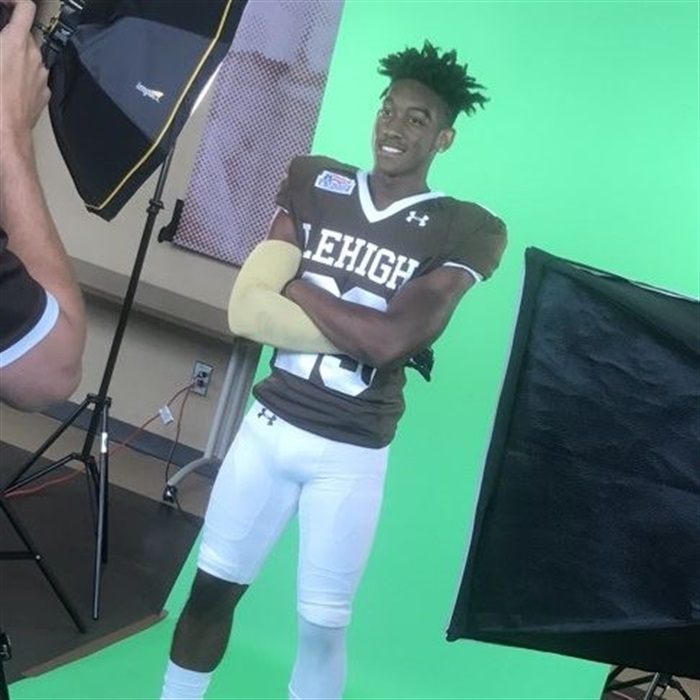 Seeing the development of Wilson as a defensive back, who was another key element to Lehigh's strong finish in the Patriot League, is something I'm watching closely. At kicker, rising senior P/K Ed Mish shook off a lot of injuries in 2017 and hopes to come out totall healthy and strong in 2018. 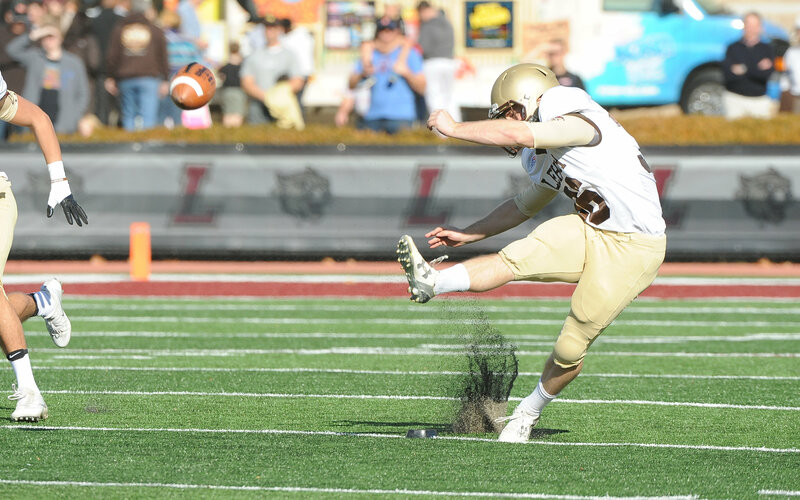 The normally steady leg of the Old Bridge, New Jersey native ended up accurate enough to be second team all-Patriot League, including a huge field goal make against Lafayette in the 152nd edition of The Rivalry to allow the Mountain Hawks to claw their way back and win the game. Where I'll be watching is his leg strength in punts and kickoffs - he only had one touchback on kickoffs all season last year. Junior P/K Austin Henning filled in well for Mish when he was unable to go as both a punter and a kicker. There's an opportunity, if Henning ends up with the stronger leg, to perhaps be the go-to guy on kickoffs and maybe even long field goal tries.